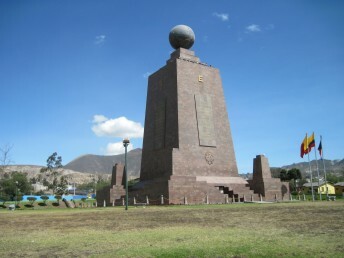 Have you ever been on the Equator? How about to cross it on a motorcycle? 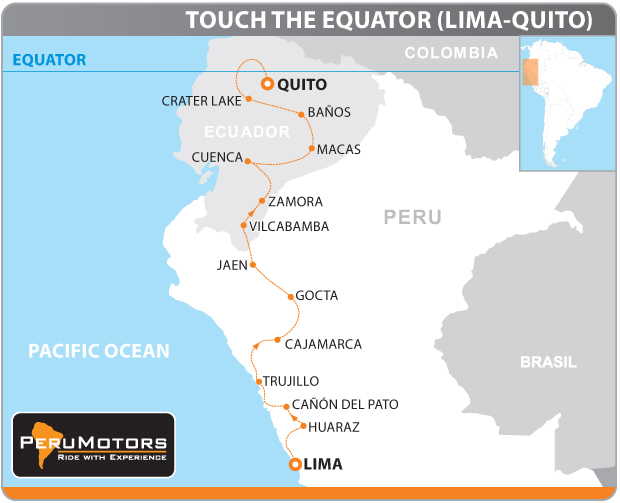 We’ll take you from Lima (Peru) to Quito (Ecuador). 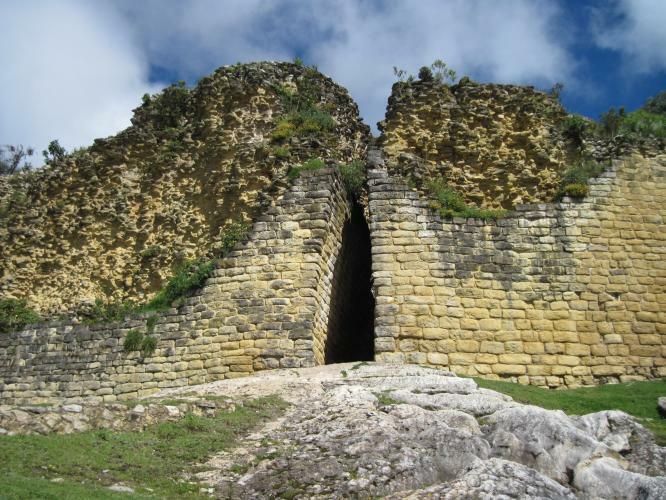 Ride through totally tourist-less northern Peru and visit the pre-Inca ruins of Kuelap, ride the Cañon del Pato (Google it !) and see the third highest waterfall in the world: Gocta Falls. 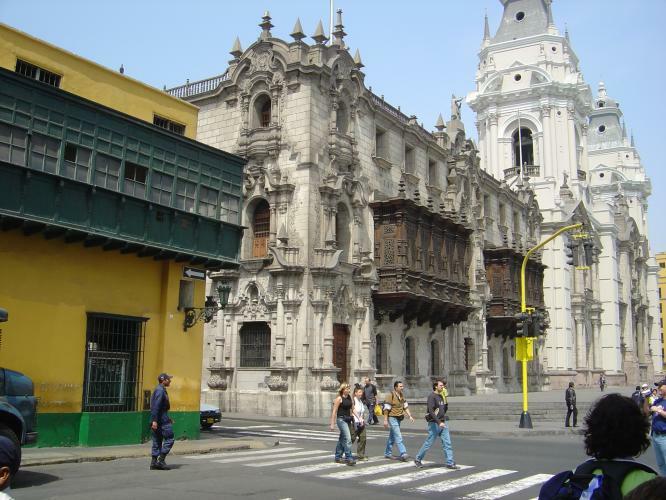 Then we enter Ecuador, where you will visit the beautiful colonial city of Cuenca and the capital Quito. 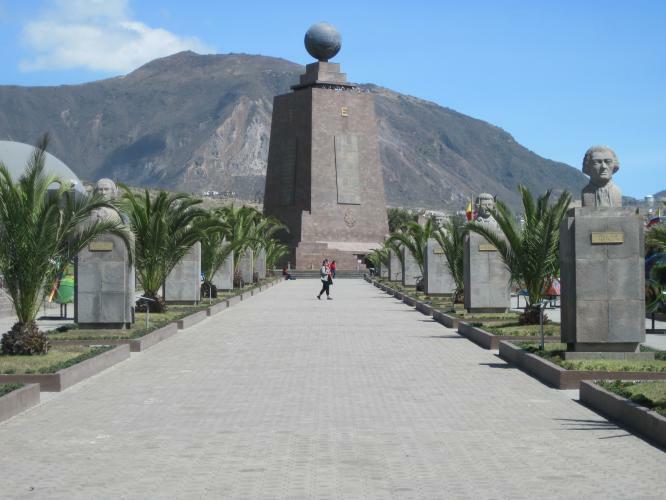 And of course, the ‘Mitad del Mundo’ Equator-park, just north of Quito. 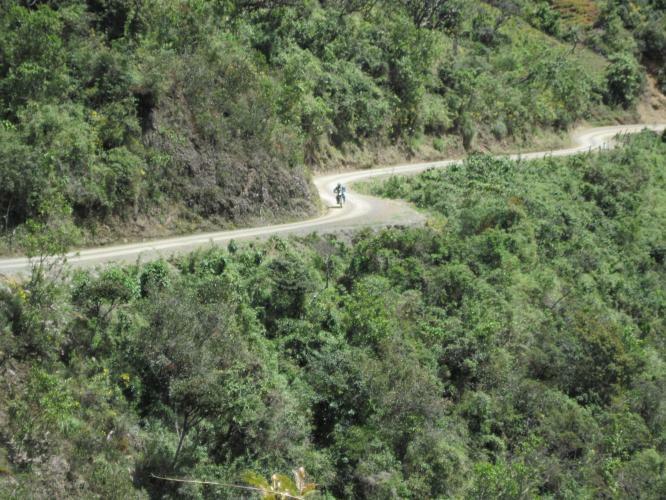 Above all, the riding is spectacular on a prefect mix of paved and unpaved roads. Join us ! Most of our guided tours have a confirmed departure, regardless the number of participants. If less than 5 riders there will be only 1 tour guide in the support vehicle. We GO ! Are you going with us ? 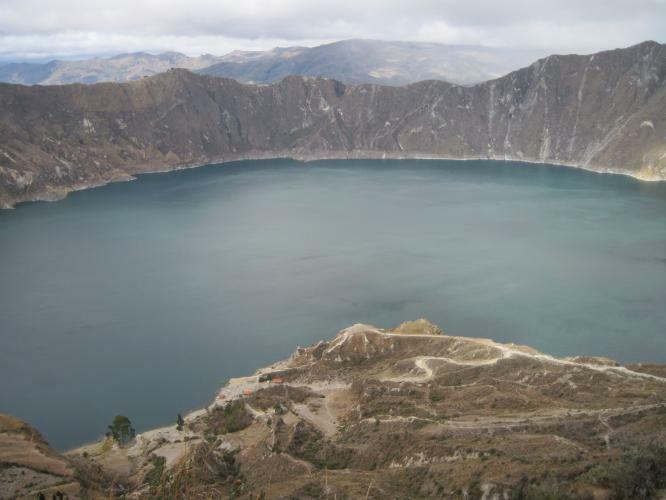 We’ll take you from Lima (Peru) to Quito (Ecuador) on a one-way tour. This tour is mainly on paved roads, but there are also some unpaved tracks involved. The unpaved roads are well maintained and you can do it without enduro experience. A very special combination of nature, culture and spectacular riding, that's for sure ! - All not mentioned entrance-fees for museums, parks, etc. * On resting-days the motorcycles are not available for riding. * * With less than 5 riders there will be only one guide in the support vehicle, but the tour WILL go. Prices are in US Dollars, per person and based upon a double hotelroom occupancy. Prices are valid until 31 December 2016. ​Before you complete your booking, please read our "Terms & Conditions" carefully. 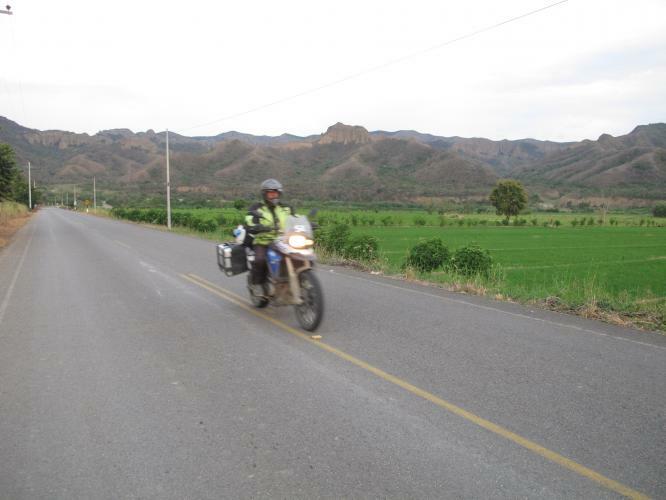 All our motorcycles are insured according to the minimum requirements of the Peruvian authorities (SOAT). This means that the rider, his passenger AND third parties are covered for medical (!) costs. Nevertheless, PeruMotors strongly advise their clients to obtain a health insurance with maximum coverage in Ecuador and Peru for the length of this tour, because you don't want to depend on the Peruvian SOAT-insurance. All our motorcycles are standard NOT INSURED for damage to the rental motorcycle AND for property damage to third parties. The Additional Damage Reduction Insurance covers this kind of damage, with an excess/deductible of max. US$ 500.00, which is also the amount of the "Security Deposit" (cash or Visa), and your maximum risk. 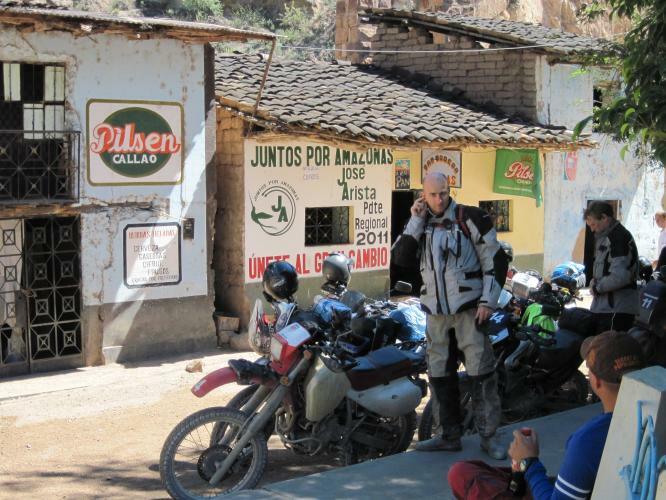 For this tour the insurance premium is US$ 225.00 per motorcycle. Without this insurance the rider/renter of the motorcycle is fully liable for all costs of damage to the rental motorcycle and third party property. 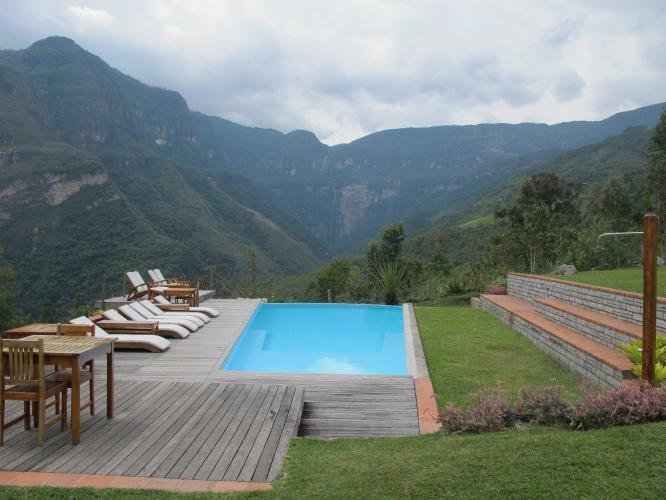 In this case the "Security Deposit" is US$ 2,500.00 (cash or Visa), but your maximum risk is NOT LIMITED to this amount ! Please, read the complete insurance information for this tour. You will arrive in Lima on day one, the capital of Peru. We will pick you up from the airport and bring you to the hotel. Your tour guide will do the briefing for the whole group about the upcoming tour. 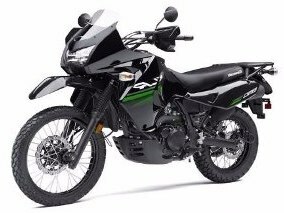 And he will arrange the necessary paperwork and the "Safety Deposit" for the motorcycle with you. We are finally on the road, on our way to Barranca. Getting used to your motorcycle. The first challenge is to find the PanAmerican Highway north bound. We follow this famous route along the coast to this little town. Into the mighty Andes, the Sierra Nevada, on our motorcycles. Over well maintained roads changes the scenery after every corner. In the distance we can see the foothills of the Huascarán, the highest mountain in Peru. If time permits we will visit Yungay. In the 1970's this town was buried by a massive landslide. More than 25,000 people were killed. Today the site is an official buriel ground for these people. Very impressive to visit. The day ends in the little town of Caraz. Back into the mighty Andes. 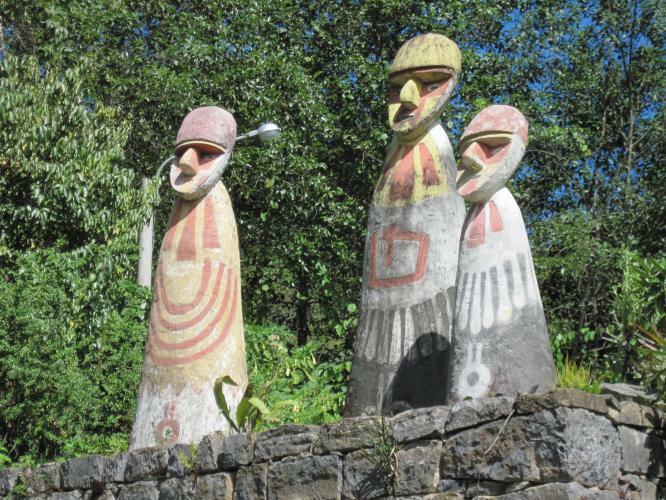 Again a spectacualr road to the colonial and old Inca city Cajamarca. This city has a very rich history. In the evening we have time to enjoy the old Inca hot springs. 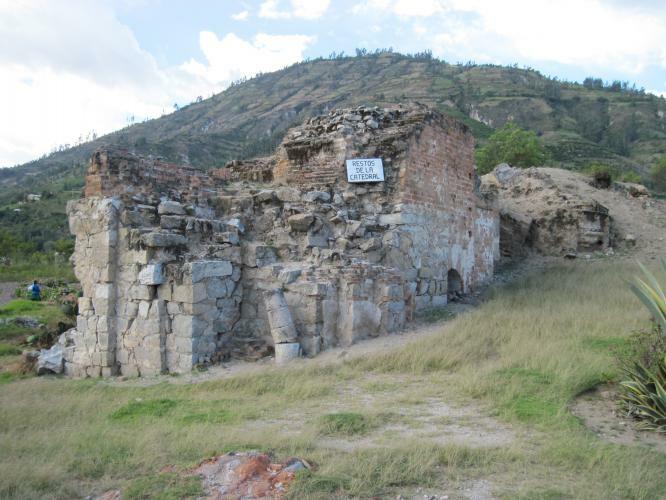 From the beautiful colonial we hit a narrow paved road with lot's of ascends and descends. We end up in the little tourist less town of Celendin. Just a riding day. More of the same, but not boring at all. Fantastic riding. This is what you came for. 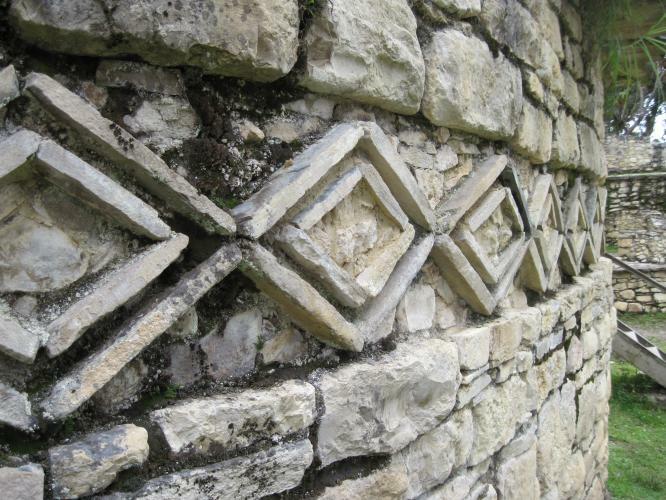 In the morning we will visit the extraordinary ruins of Kuelap. Not well-known, but just as interesting as Machu Picchu. After our visit we follow our way to the third highest waterfall in the world: Gocta Falls. From our hotel we have 'Jurassic Park' like views. After a quick last look at the Gocta Falls we are back on the motorcycles. Again great riding over paved curvy roads through deep canyons and the temperature will rise comfortably. After the lunch in the lifely town of Jaen we are heading north bound on our way to Ecuador. We spend the night close to the border. 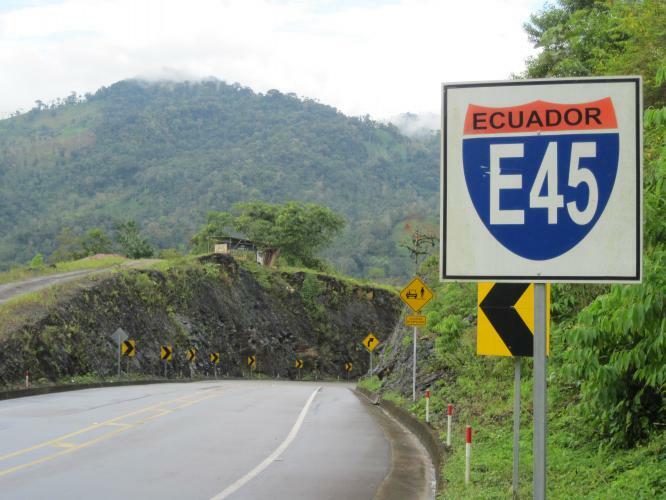 In about 50 paved kilometers we reach the Peruvian-Ecuadorian border, in the middle of nowhere. 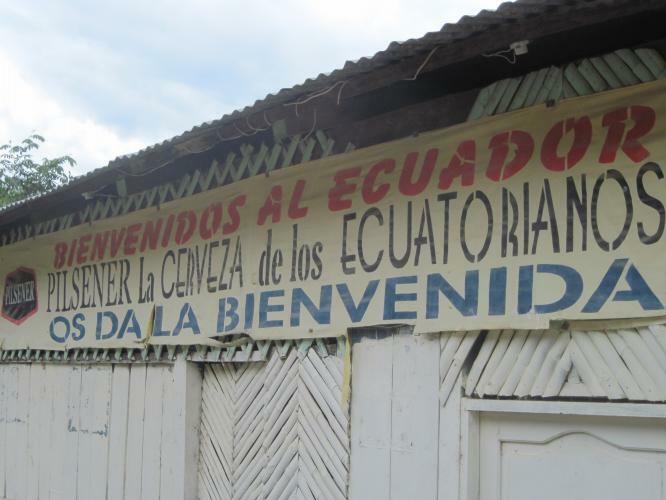 After the border formalities we enter Ecuador and follow on 60 kilometers on unpaved roads. Then we arrive in the laid-back little town of Vilcabamba. We stay in a very nice hotel on a hill slope. Time to relax. Until the lunch we stay in Vilcabamba. Then we hit the road for just over 100 kilometers to Zamora, where we stay again in a nice hotel with a pool, specatacular views and a nice atmosphere. A great ride again from the jungle into the high mountains. We end up in the colonial city of Cuenca, founded in 1470. This city is on the UNESCO list. So, it is great top walk around and enjoy the town. Back to lower altitudes and the jungle. A curvy road, great riding. In Macas we stay (again) in a nice hotel with a pool. 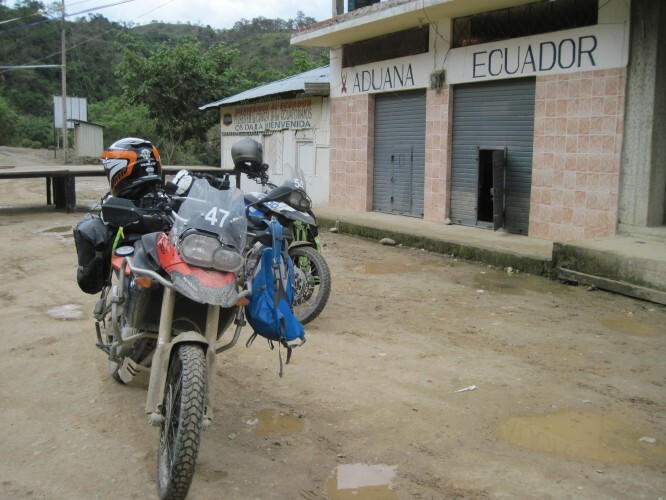 A relative short ride to the backpack capital of Ecuador. In the afternoon there is the possibility to relax in the local hot springs. Or to do some more active excursions, like: canopying, rafting, down hill mountainbiking, volcano watching, etc., etc. Back into the Andes over paved and unpaved roads. Highlight of today is a spectacular 'Crater Lake'. The last riding day, over unpaved roads to Santo Domingo. From there we go the theme park "Mitad del Mundo", exact (?) on the Equator, just north of Quito. 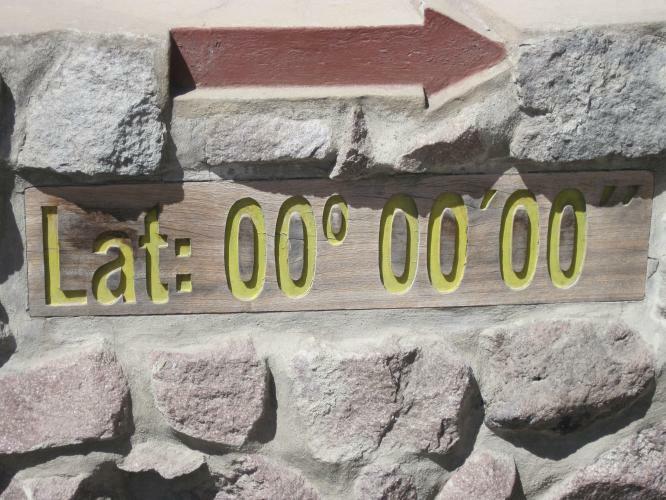 Here you can 'Touch the Equator'. Then the last 30 kilometers to Quito to our hotel in the center of the city. In the evening we can enjoy the nightlife of Quito. Time to say 'Goodbye' to the motorcycles, the group, to Ecuador and to the tour guides. The transfer to the international airport of Quito is arranged for you. From there you take your flight home. Is Peru safe to travel on your own? YES !!! The roads are good and the people are very friendly. Of course, you'll have to be cautious, like you would be at home, or in any other part of the world. South America (Peru) doesn't have a good reputation, but in our 12 years in business, not even one of our guests experienced big problems. And, by the way, we live ourselves with our families for more than 12 years in this country. So far without any major problems with criminality. No. Our guests are coming from all over the world and as a tour operator we are not big enough to bargain good prices with the airlines. So, you'll have to arrange your flight to Arequipa (and back). We will provide you the exact dates for arrival at and departure from Arequipa. To which airport do I have to fly for a tour? In general, you'll have to fly to Arequipa, Peru (airportcode: AQP). This city is our homebase. Normally you will fly to Lima, the capital of Peru, and take a domestic flight from there to Arequipa. Very often the airlines offer the domestic flight from Lima (Peru) to Arequipa (Peru) for a small addition to your international airfare. Ask for it ! How do I make a booking for your tours? Search for the <BOOKING> tab on the page of the tour you want to book. Fill out the form click <SEND>. We will contact and inform you about the rest of procedure. I'm not very tall. Is it possible to lower the motorcycle? 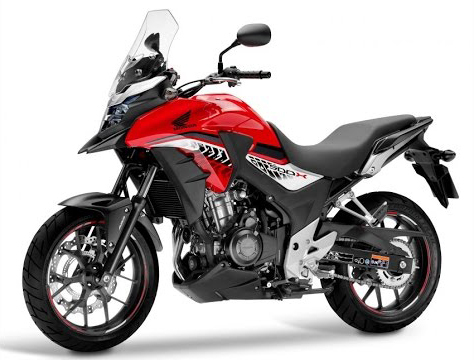 Suzuki DR650: Yes, this motorcycles has the possiblity to lower the rear suspension with 5 cm. 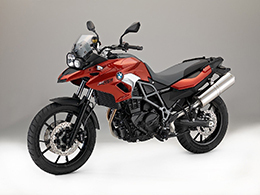 BMW F700GS: No, we can only offer an original BMW lowered seat, which lowers the seat height with 3 cm. 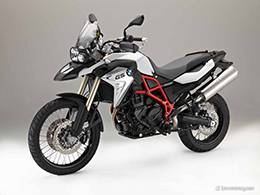 BMW F800GS: No, we can only offer an original BMW lowered seat, which lowers the seat height with 3 cm. 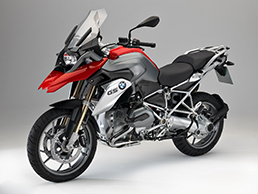 BMW R1200GS: No, but we can put the seat in the lowest position. Is there a spare motorcycle available on the tour? What happens if I wreck my motorcycle? Well... with our experience, if the motocycle is wrecked beyond repair, most of the time the rider is not in a good shape to ride a motorcycle anymore. If you are still fit enough to ride, we will try to get the motorcycle back on the road. If this is not possible, we will try to replace the motorcycle. For the time being you'll have to join our mechanic in the support vehicle. Sometimes, on certain routes, the motorcycle guide can give you his motorcycle. Is any food and/or (soft-) drinks included? - Self guided tours: the standard breakfast in the hotels is included. - Guided tours: the standard breakfast in the hotels and the lunches on riding days are included. Is it likely to suffer from altitude-sickness? 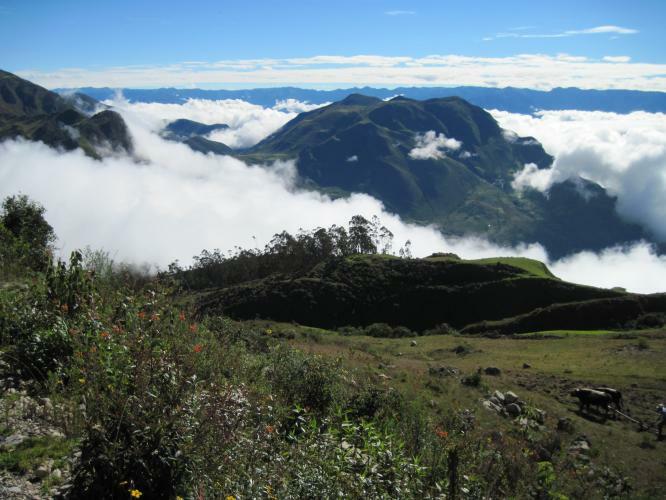 Most of our tours have differences in altitudes between sea-level and about 5.000 meters (16,400 ft.). On average about 50-60% of our guests will suffer some symptoms, like headache, nauseousness, insomnia, etc. Let's say: "flu-like symptoms". It is impossible to predict who will suffer the symptoms and who won't. Fitness and age of the person doesn't seem to matter. There is a lot you can do to avoid the symptoms: On altitude drink lot's (at least 3 liters / 0,75 a gallon) of non-alcoholic fluids, like water, coca-tea, coffee and soft drinks. And eat chocolate, candy and other sweets. In severe cases oxigen is needed, but that is quite rare. All hotels on altitude have it available. Or you can use medication, like Diamox. Our advise is that you don't take any medication, before you have the symptoms. In case of severe symptoms it is even better is to buy 'local stuff' in the Farmacias in Peru. Everybody will at least notice that they are on altitude, for example while climbing stairs. Normally your body will be adjusted to the altitude in about 4-5 days. And the symptoms will disappear by itself. Are the airpoirt transfers in Arequipa included? Yes ! We will pick you up from the airport, or we will send a taxi to pick you up. And, of course, after the tour we will take you to the airport for your flight home. What is the best time of the year to pay Peru a visit? Weatherwise, roughly between March and December, becasue that is the dry season. In the highlands a rain shower can be expected year round. 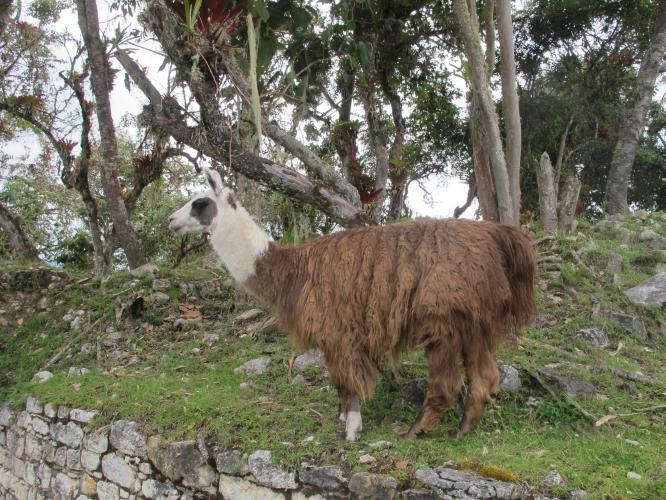 Do I need a visa for traveling to Peru? Citizens from most countries in Europe and North and South America can enter Peru with a "Tarjeta Andina de Migración" (TAM). This is a tourist visa which you can get upon entering Peru. Please, check for yourself if you need a visa, or if you can enter with TAM. And how about a visa for Argentina, Bolivia, Brasil, Chile and Ecuador? It is your repsonsibility to get the necessary (tourist) visa(s) for the countries you travel. PeruMotors can not help or assist you with that. Please, fill out the fields at the bottom of this page. 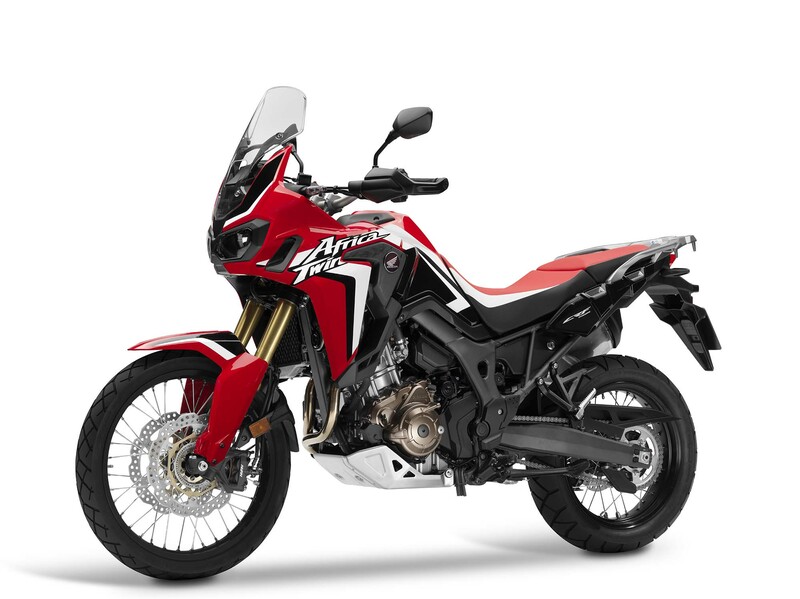 Upon booking for a tour or rental a down payment of US$ 1,000.00 per participant is required to secure your place on the tour or your rental motorcycle. You can authorize PeruMotors to charge your major credit card (Visa, MasterCard, AmEx and Diners Club International). If you want to use this option, please download our "Credit Card Authorization form" from our website, print it, fill it out, sign it and scan it. Then send it back to us by email. Or, you can wire the amount with a international bank transfer to our Peruvian bank account. About six (6) weeks before the departure of the tour we will send you the invoice and detailed information about your tour. Download our 'Booking Form' by clicking here. Please, complete with international access code, e.g. +29 123 456 789.